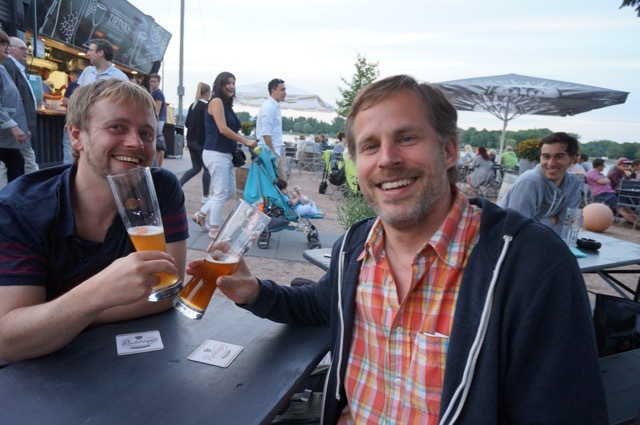 Adam is currently visiting the JGU Mainz lab, testing various fluid compositions (see proof in figure). Denis and (now Dr.) Max were very helpful in explaining the artificial cave and issues related with precipitating carbonates. Seb and Matthias joined from RUB to discuss experiments that Matthias will conduct during his MSc thesis in Mainz and to plan the field and lab work in New Zealand later this year. Cinthya, Inken, and Max will visit Waikato in winter and perform experiments in Adam´s lab, take care of the monitoring and to take samples from speleothems. A very long, but productive day was concluded with dinner and beer at the Main terraces. Adam and Denis during fluid testing. *the true Currywurst is – of course – only available in Berlin!